Detectors are one of the most important elements impacting the quality and reliability of alarm systems. Thus their correct selection and application requires theoretical expertise and experience. In order to systematise this group of products, it is convenient to divide them into functional categories. The purpose of perimeter protection is to secure the premises and elements of landscape architecture located on it. It is made up of devices designed to work in harsh environmental conditions, maintaining reliable detection capability and functionality unchanged for many years. These detectors make it possible to detect the presence of a burglar before he causes any damage to the building. They are designed to secure large areas: one device can supervise as much as 100 m2 of the premises. The detectors can be installed either directly on the flat surface of the façade or with the help of special brackets that enable the detection field to be better adjusted to the shape of the terrain. 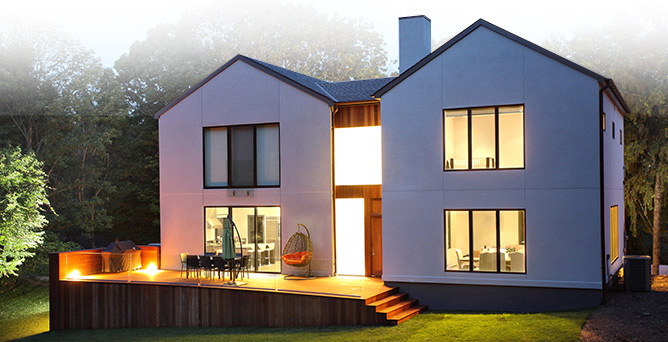 Models provided with an additional dusk sensor can also be used to control elements of building automation, including outdoor lighting or roller blinds/shutters. The role of detectors dedicated to provide perimeter protection is to detect any attempt of intrusion into the protected area so these detectors are also dubbed "detectors for the first line of protection". The most popular devices in this category are magnetic door and window opening detectors, commonly known as "reed relays". 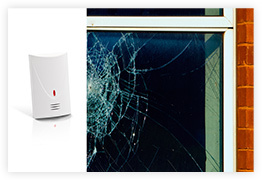 These devices make it possible to create a virtual invisible fence or "curtain", the penetration of which will trigger an alarm. They can be used to secure both the fencing of the premises as well as the line of the external walls of the building. They have two detection paths: infrared and microwave, each with independently adjustable sensitivity. Therefore, operation of the detectors can be customized to the function performed, characteristics of the protected building as well as the needs of its users. 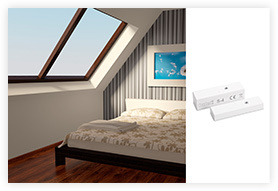 In response to installation requirements, operating conditions and appearance, the SATEL offer includes an entire assortment of detectors, from miniature devices mounted directly in a window or door frame to large detectors fitted with tight metal enclosures able to withstand considerable pressure exerted by, e.g. the load of a car. This group of products includes both detectors equipped with clamp connectors for direct wire connection and also detectors which require soldering the applicable wires. We also offer detectors in colours similar to those of the woodwork so that they become practically invisible after their installation. They are designed to detect the characteristic sound of broken glass, which makes them a perfect solution for protecting glazed spaces. A single detector may secure a room with numerous window panes. SATEL's glassbreak detectors use the technology of microprocessor analysis of two frequencies, thanks to which they do not react to typical noise sources that might interrupt operation of simpler detectors. They are used to detect attempts of neutralising mechanical protection elements with the use of force. Their design enables them to detect a burglary attempt even before burglars are able to neutralise the above-mentioned protection elements. SATEL's vibration detectors use piezoelectric sensors with digital sound processing, which ensures high repeatability of parameters and resistance to typical false alarm sources. 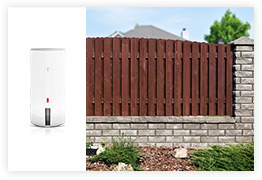 These devices are one of the most advanced detectors for perimeter protection. In order to detect intrusion attempts, they use infrared beams continuously transmitted between a transmitter and a receiver. Due to considerable distances between these two elements, active infrared detectors may be used for effective protection of large spaces. 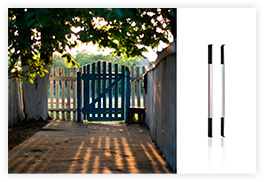 The detectors offered by SATEL are properly proofed against weather conditions, which enables them to be used outdoors to detect potential intruders entering protected premises. Devices belonging to this group are used to detect intruders present inside rooms within a protected area. 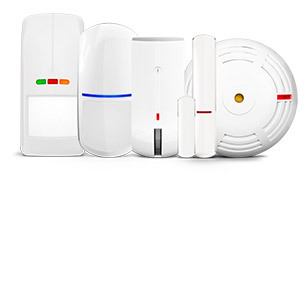 The most common devices from this group include motion detectors available in numerous models and variants. 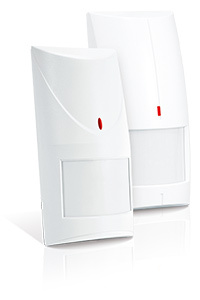 In order to detect motion, alarm system detectors may use various physical phenomena. 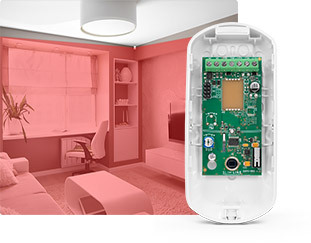 However, the installation practice shows that most commonly used devices include passive infrared detectors (PIR) with connected microwave detectors using the Doppler effect (so-called dual detectors). They use the phenomenon of infrared radiation emission by each object of temperature different from absolute zero. Their design includes a special semiconductor sensor which, in connection with a correct optical system, is able to record changes in the infrared radiation intensity in relation to the background temperature. As a result of a correct analysis of such a signal, passive infrared detectors are able to detect a human moving within their range of operation. 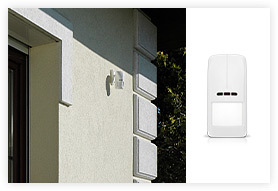 PIR motion detectors are extremely popular due to their reliable and easy operation. They are the most commonly used detectors in intrusion detection systems. Effectiveness and reliability of PIR detectors depends on a number of factors including the quality of components used, optical system design, detector mechanics or method of sensor signal analysis. 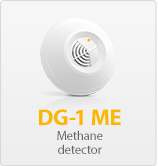 The SATEL's motion detectors offer is based on devices with digital signal processing. Even AMBER detectors, i.e. the basic model in this group of products, are equipped with microprocessors for signal analysis. In comparison with analogue technologies, digital solutions are much more reliable and repeatable. The differences between individual models offered are connected with the optical systems used. Flat plastic Fresnel lenses, which can be easily replaced, ensure fast adjustments of detector operation characteristics. However, a system including a mirror ensures more extensive coverage of protected space with detection areas. The models offered are also different in terms of the detection algorithms used. The 1st generation digital algorithm used in AMBER detectors and the AQUA family is a perfect solution for basic applications. However, the extended algorithm used in the GRAPHITE and IVORY ranges ensures stable operation even in most difficult conditions. Dual detectors combine a few detection methods in one device. The most commonly used passive infrared detectors combined with a microwave beam allow to detect an intruder by means of independent physical phenomena ensuring reliability even in most difficult conditions. That is why, they are often selected to protect rooms subject to frequent draughts or rapid temperature variations, e.g. garages, unheated halls or warehouses. The COBALT family of detectors includes basic digital dual detectors whose design uses 1st generation detection algorithms. In applications where the highest effectiveness is the priority, perfect results are ensured by SILVER detectors. 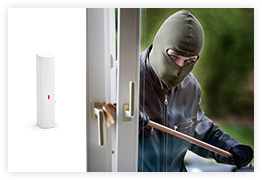 Their unique feature is the possibility of detecting a masked intruder, thanks to which they may ensure better protection in comparison with standard PIR detectors. The advantages of SILVER detectors are documented by a certificate confirming fulfilment of the requirements specified in European standards for dual detectors, i.e. EN50131-2-4:2008 for Grade 2 devices. It means that, according to national regulations, a SILVER detector may be used even in banking facilities requiring the highest safety standards. A modern alarm system not only ensures detection of a burglary attempt. SATEL's systems perfectly recognise dangers having potential negative impact on our health or causing considerable material losses. In order to provide a functionally extended system, it is necessary to equip it with additional detectors extending the protection range. The role of gas detectors is to detect substances exerting possible negative impact on human life or health and inform about their presence. 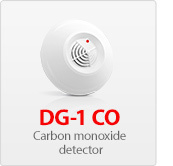 This group of devices includes detectors of poisonous carbon monoxide which may be generated in rooms where a combustion process is not accompanied by sufficient amounts of oxygen. Due to the strongly poisonous effect of carbon monoxide and its odourlessness, this substance is particularly dangerous for persons present in affected rooms. A similarly serious risk is posed by explosive gas leaks, e.g. natural gas commonly used in households or propane-butane used both in households and as alternative vehicle fuel. 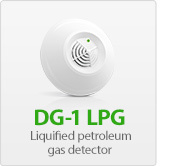 The DG series gas detectors offered by SATEL provide perfect solutions as regards warning about the presence of these substances. Additionally, a narcotic gas detector may prevent household members against a burglary attempt preceded with dazing them by means of chloroform-based substances. Flat flooding caused by hydraulic installation malfunctions may result in considerable material losses. Thus it is worth considering installation of an applicable detector which may not only warn about the presence of water but also, within a more extended alarm system, activate emergency cut-off of water inflow by means of an electrically operated valve. 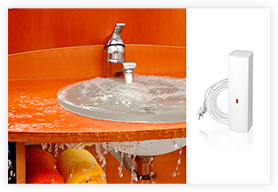 FD-1 water flood detectors offered by SATEL are a perfect solution for such applications and, thanks to an external sensor connected by means of a flexible line, they may be used even in normally inaccessible locations. 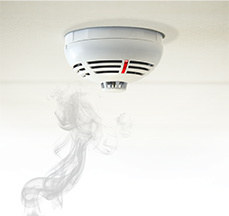 Presence of fire is an extremely serious risk so it is worth considering fitting an alarm system with a detector sensing even minimal amounts of smoke generated during an early stage of fire. 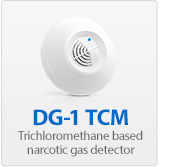 TSD-1 detectors, thanks to combining an optical smoke sensor with a precise heat sensor, ensure reliable detection of spreading fire. In combination with effective communication offered by modern control panels, they may provide timely assistance and prevent serious losses.